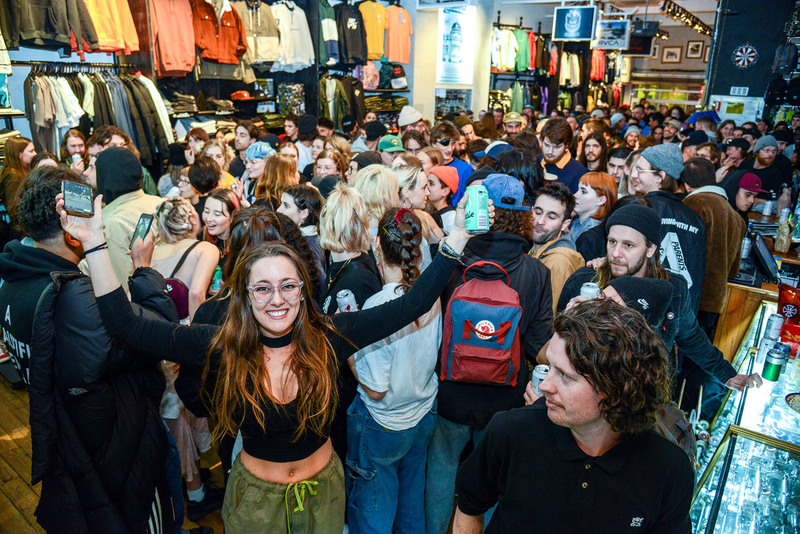 Friday night Fast Times city store hosted what was one of the fullest and most excited video premierEs I think any of us have seen in a long time, if ever! The house was completely full to the brim, to celebrate the much anticipated all-girl street crew DNL’s “ABD” filmed and edited by 21st birthday girl Adelaide Norris. Attending the night was compared with riding a rollercoaster, with the room roaring without a moment going by in silence. With what felt like the entirety of the Melbourne scene showing up and certainly voicing up! Proving that the progression of women’s skateboarding is the most alive, supported and thriving it has ever been. Melbourne you’re really leading the way with this exciting emergence, for now here’s some of what went on, with the video to come post Brisbane Fast Times premier. Heavy hitting crew love. Local crew showing the love of skateboarding is for all. Raise the roof! Nice to see some non-skaters at the prem: Mappy, Neih, Digby and Ben. DNL International: Fly in Kiwi Annabelle & Ben. Broken//filmer/21st birthday'er Adelaide Norris and Rivers local filmer Albert. Fresh to Melbourne Barry, with Westside boys, Paddy, Harry and Sakazi. Questionable advertisement? A mix of supportive Mapstone’s and the ever positive Mel. “Skinned baby”/ Mia, Hayley Wilson and the DNL cupcake queen Amy. DNL HQ housemate love (for their beer sponsors). A likely bunch. A picture tells 1,000 words - The birthday gift of a VX enables an entire room of smiles and tears. New-Old gets a facelift... and cops a hiding!